If you think downloading yet another mobile app featuring photo-sharing, geo-location, and social networking is crazy, prepare yourself for a moment of insanity. Meet Trover, a really nifty new iPhone (s AAPL) app launched in May that perfectly fills the gaps left by Instagram, Foursquare and Yelp. Trover, which is free, allows you to instantly share photos of things you’ve seen and places you’ve been with your friends and the people around you. Trover entries are automatically geo-tagged to the location in which its photo was snapped. Trover aims to catalog the “discoveries” people make when exploring a certain place — think hidden gems such as street art, not the Statue of Liberty. 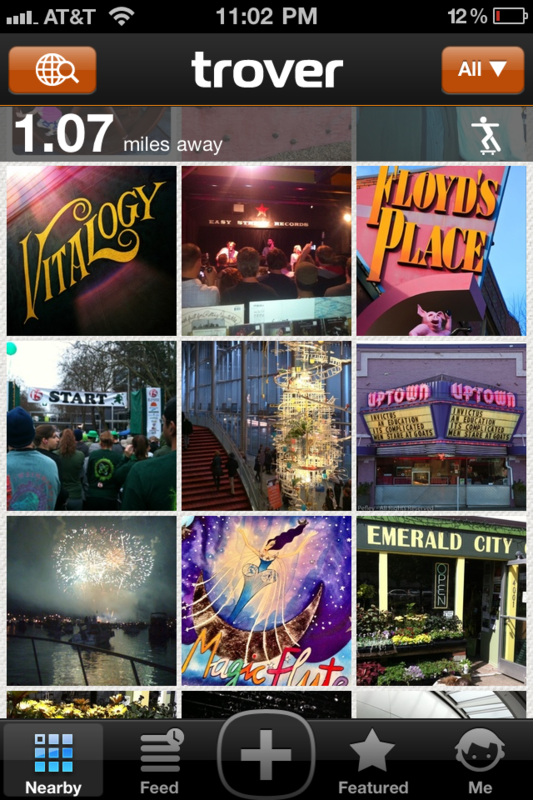 The app differs from Instagram in that nearly all the photos on it are of places and things– not people. And while Foursquare is great for ephemeral events, such as meeting a friend for a drink within the next hour, Trover documents things that are a bit more permanent. Yelp is a fantastic tool if you know exactly what you’re looking for: say, the best Thai restaurant in San Francisco’s Mission neighborhood. But Trover is geared a bit more toward meandering discoveries. 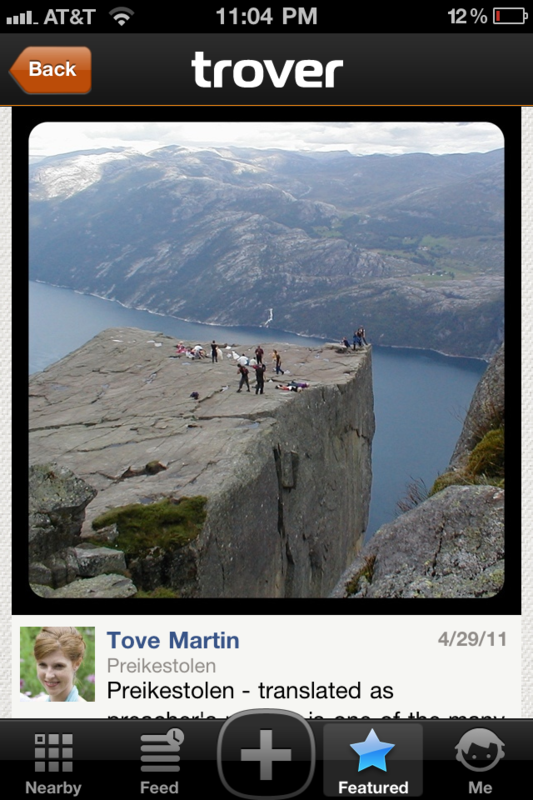 Trover plugs into your social network through Facebook connect. As a user, you can choose whether you see all the Trover discoveries within a certain region, or just those added by your friends. Karas and his team quickly realized that Trover had potential as a standalone project, and it was soon spun off it into its own independent company. The app launched on May 4, and since then, it has been spreading like wildfire. Apple’s (s aapl) iTunes named Trover an “app of the week” in its second week on the market, recognition that Karas told me gave the company a “huge boost” early on. Now just five weeks old, Trover’s users have uploaded photos from more than 140 countries, Karas told me. The company, which currently consists of three developers, one designer, and Karas, is hard at work building new features and streamlining the site. Presently, Trover’s small team has two top priorities: Building an Android (s goog) app, and improving the algorithm by which it displays entries. Discoveries aren’t ranked by users — you simply click “Thanks” if you see something you like — so Trover displays its entries in an order determined by the number of “Thanks,” shares, and page views they’ve received. “We’re actively working on being more magical about how that matrix shows you things,” Karas said. The company has been approached by interested investors, but Karas tells me Trover has the wherewithal to keep operating for at least another 12 months without taking on additional funds. In March 2010, Travelpost raised $9.8 million in Series A funding, and a portion of that was allocated to Trover at its spin-out, Karas said. 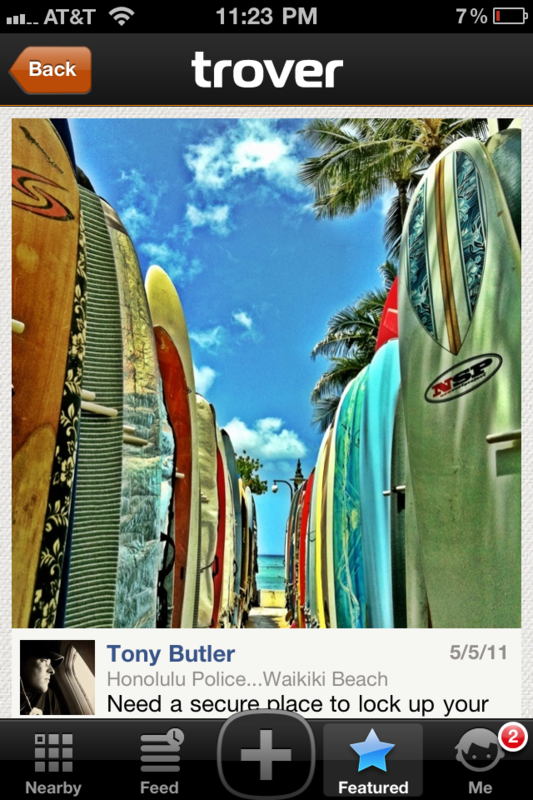 Facebook photo sharing app will be launched shortly and make life very difficult for trover. Heads up though for doing a much better job than color with 10times less money!